Posted March 22, 2017 by Sheri Bell and filed under the categories Apologetics, Resurrection. In this, our fourth of six blog posts exploring the validity of the resurrection of Christ, we invite you to consider the factual, historical evidence that gives believers certainty that Jesus rose from death, leaving behind an empty tomb as He promised! You might choose to first read our earlier blog posts on the crucifixion and burial details, if you missed them. This week we look at five important facts of the empty tomb, and why the Roman Guards and Jewish leaders chose to cover up the truth of Jesus’ resurrection. In the blink of an eye, on the third day of entombment, something amazing happened: Jesus beat death to live again! No other empty tomb holds such significance! This is the part of the resurrection story that critics really don’t believe. 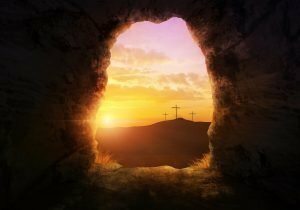 Some have objected to the empty tomb story by claiming that it was development of legend or an apologetic device, rather than historical fact. But one of the most compelling evidences showing that the empty tomb story is true is that its emptiness was discovered first by women. This is significant because in Jesus’ time, women held very little power or authority. In fact, except in rare cases, Jewish law precluded women from giving testimony in a court of law. So if the resurrection accounts had been manufactured, as critics claim, women would NEVER have been included as being the first witnesses. Common sense tells us that the best reason the women were reported as holding that honor, is because it was the truth of what happened. These women were brave, but the Bible tells us that Christ’s male disciples weren’t. Most scurried to hide as Jesus faced His darkest hours. Yet the Jewish leaders credited these men with possibly possessing enough courage to try to steal Jesus’ body, in order to circulate the rumor that He had risen. So the Jewish leaders took extra precautions: they ensured that Jesus’ burial site, a new, unused tomb belonging to Joseph of Arimathea, was guarded by a unit of highly trained Roman soldiers. This guard unit, of four to 10 men, knew they faced severe punishment — even death — if Jesus’ body went missing under their watch. So to think these soldiers didn’t take their orders seriously, and diligently police the tomb around the clock (some would have slept while others held watch), is preposterous. Who knows if those soldiers, despite taking the bribe the Jewish leaders gave them to keep quiet, became believers? Or when the shock passed, did they, like many critics, simply refuse to believe what they had experienced? Many theories have been put forth to discredit the resurrection. One of the earliest theories asserts that the tomb site of Jesus was unknown. I have to scratch my head at the stupidity of that one. Joseph of Arimathea, a member of the Sanhedrin, clearly knew where his own tomb was, as did Nichodemus, who helped Joseph to prepare Jesus’ body for burial. The guards also clearly knew the tomb’s location, as did the priests. Even the women who approached the tomb three days later and found it empty knew its exact location — as did the disciples who ran to see it for themselves upon hearing the women’s story! The secrecy plot has so many holes it doesn’t hold water, people! Let’s recap five important facts of Christ’s resurrection. You might include the facts as you share the Good News with friends and family this Easter season. #1: The Roman Seal was Broken: The seal represented the full power and authority of the Roman empire. Anyone seeking to steal Jesus’ body would have been very aware that in doing so they were taking on Rome. Would Jesus’ disciples have dared to do so? No way! They were confused and afraid, and most were in hiding. Even Peter, who swore he’d be willing to die for Jesus, denied knowing Christ three times before the crucifixion! In his Gospel, Luke used the same root word kulio, but added a different preposition, apo. Apo can mean, according to Greek lexicons, “a separation from” or “distance from.” Apokulio, then, means to roll one object from another so that it is “separated some distance from it.” John, in chapter 20 of his Gospel, used a different Greek verb, airo, which means to “pick something up and carry it away.” Bottom line: Jesus’s disciples, if they had found the courage to steal His body, wouldn’t have wasted the time or energy to move the stone so far away — particularly if they were also having to fight off the Roman soldiers! 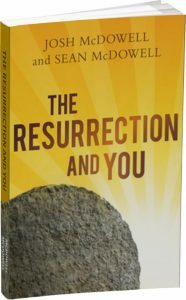 #3: The Graveclothes Remained: Jesus was gone, but His graveclothes bore witness to His resurrection! If you recall from last week’s blog post, Jesus’s dead body was wrapped in linen cloth containing aromatic spices mixed with a gummy substance called myrrh. The myrrh would have adhered closely to Jesus’ body, making it almost impossible for anyone stealing Jesus’ body to remove the linen. As Reverend Michael Green says, “No grave robbers would have been able to enact so remarkable a thing. Nor would it have entered the robber’s head. He would have simply taken the body, graveclothes and all.” Indeed! #4: Guards Paid to Keep Silent: The Jewish leaders immediately understood they had a problem. Not only could they not produce Jesus’ missing body, but they needed to quickly hush the live witnesses! So they bribed the soldiers with a good chunk of change, and promised them protection should Pilate seek to punish them for failing to guard the tomb. Obviously, the Jewish leaders must have inspected the tomb and realized that the guards were telling the truth. Why else would they cover for the guards and pay them money to spread the lie that they fell asleep? Why is it so easy for us to discredit the obvious? In next week’s blog post, we’ll examine and debunk other theories that have been put forth to discredit Christ’s resurrection. Even the Israelites, who saw so many of God’s miracles first-hand, found it easy to doubt and discredit God. So should we be surprised that some critics simply refuse to believe that Jesus, as God in human form, could die and rise again? God is the great I Am! He holds the past, the present, and the future in His mighty hands. You and I are called to love God — and each other — because He first loved us. Until we each can, with humble gratefulness acknowledge and accept the gift of the cross, we shall have trouble fully loving and following God. In just three weeks we celebrate Easter. Take the Easter Challenge: with whom you can share God’s amazing love for us? Who can you invite to church on Easter Sunday? After just reading about what Jesus did for you and me, are you moved to know him personally today? « What Is the Unique Worldview of Students Today?